Van Horn researched from coast to coast for secrets to the fried chicken sandwich. Up there with the fun, very good and stylish changes to the culinary/bar scene in South Brooklyn of late is The Van Horn Sandwich Shop. At Court and Baltic in Cobble Hill, this casual enclave opened in February with little more than a plain flyer on the window stamped, “Open,” in red. The Van Horn Sandwich Shop has been buzzing for lunch, dinner and drinks since then, without the assistance of a PR firm or marketing gimmicks and in fact, without a sign on the shop at all. The early success of Van Horn’s owes as much to the shop’s juicy, nearly perfect fried chicken sandwiches, fried cornbread hush puppies, juicy pulled pork with crisp house-made slaw and Southern treats like the grilled pimento cheese sandwich, with or without bacon (an addicting, dangerously-good hangover cure), as it does to the down-home charm and friendly-vibe of the small place. The food here is truly excellent, and consistently so. The address, 231 Court, has been plagued for years with failing establishments including Jill’s Vegan Cafe and the short lived Cafe Mei Mei, an odd little restaurant with service at times so icy it seemed intent on driving potential customers away. But then along came Jacob Van Horn, a disarming gent from Chapel Hill, N.C., by way of Williamsburg, Brooklyn. Van Horn was working as an architect when he was laid off during the economic crash from behemoth firm Skidmore, Owings & Merrill in Manhattan (architects of the Freedom Tower). 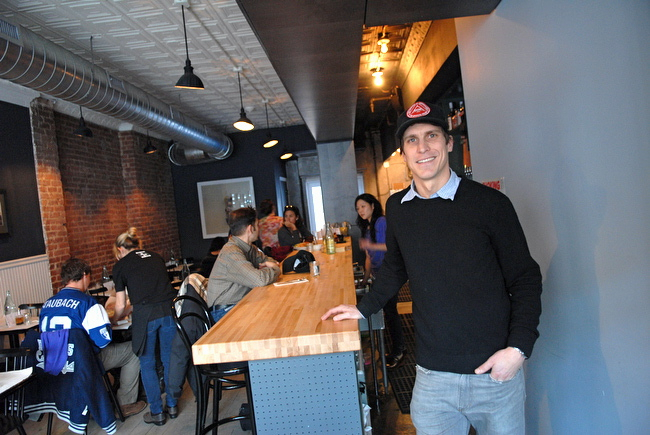 Unemployed, Van Horn decided to follow his dream and open a restaurant. He hired his old friend, Rick Haufman, who’s worked in restaurant kitchens since he was a teenager, and brings with him family recipes from North Carolina. Haufman spins some magic in Van Horn’s kitchen, and the steady crowd is testament to his skills. The Chapel Hillians come to Court Street in Cobble Hill on the forward drive of a stylish group of young entrepreneurs setting up shop around here. Van Horn’s menu is uber-simple, offering Fish for $11, Pork for $10, BLT for $8, Pimento cheese bacon lettuce, $8, roasted beets, $4, among other offerings. The interior is clean and fresh, with exposed brick on one side of the room, and a modern dark gray bar on the other. 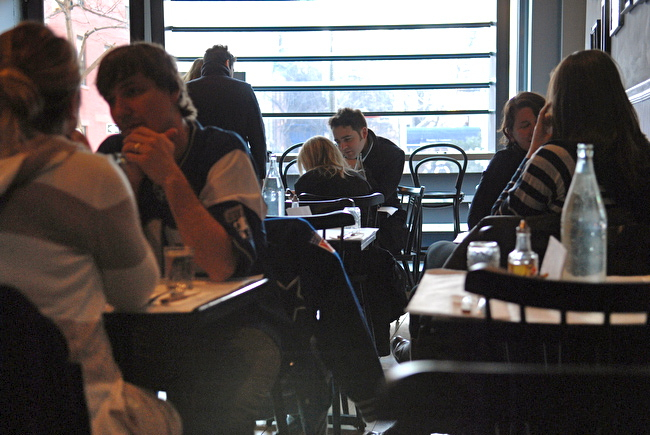 In the middle, small tables are covered in white paper and adorned with house-made pepper vinegar. 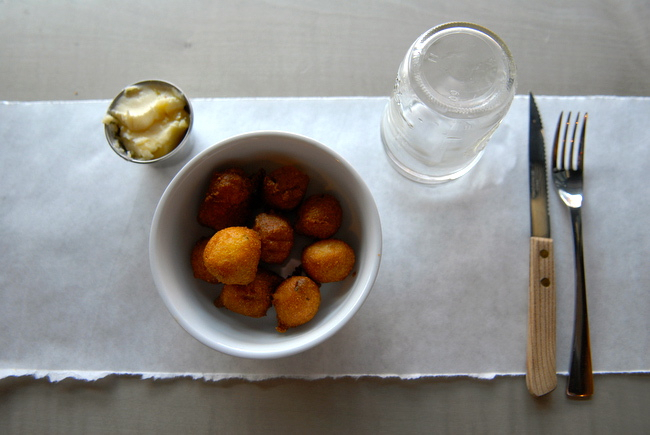 In a sort-of glorification of simplicity, evidenced by the sleek design and everyman’s offerings at Van Horn, one might detect a bit of thumb-to-the-chin at Brooklyn pretension. Van Horn’s proudly displays its beer cans behind the bar; shelves are lined with Jim Beam and Jack Daniels, though on draft is a rotation of fine ales, and 18 whiskeys are stocked. I took my buddy into Van Horn’s for lunch one day. My friend is from Ohio, named Jimmy Ohio, to be exact. He ordered the pulled pork sandwich. “Where’s the sauce?” he asks me, when served. I look up, shortly thereafter, and the sandwich is gone. “Did you like it?” I ask. “Yeah. Once I figured out there wasn’t anything missing. It was great,” he says. Van Horn’s N.C. guys are making North Carolina style BBQ. If you aren’t from North Carolina, or you haven’t had the pleasure of visiting, you might not know about North Carolina BBQ or Southern BBQ, and its styles and cultures and strict traditional rules. Pulled pork is a sort of religion down there. In North Carolina, they eat pulled pork marinated in a vinegar-based sauce. Its preparation doesn’t include anything red, brown, sweet or thick. At least, in part of the state. Different styles are made in different regions. It’s a really long story. 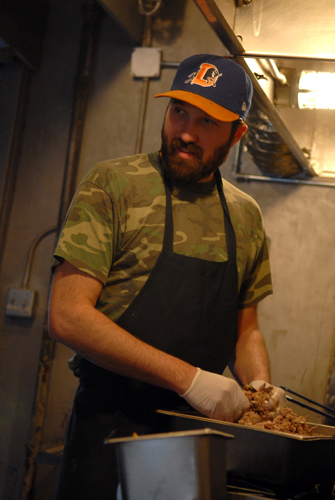 Rick grew up in Chapel Hill in the culture of pulled pork. When families go out, they go to pig-pickens. The guy with the best pulled pork is king. Roadside shacks serve mounds of the juicy, moist stuff. According to Rick’s book, “Holy Smoke: The Big Book of North Carolina Barbecue,” the quality of pulled pork is about process. “It’s how you cook it, not the sauce,” the book says. Good pulled pork doesn’t need sauce. At Van Horn’s, there a little metal smoker in the kitchen. Van Horn’s marinade is white vinegar, apple cider vinegar, water, brown sugar, chili powder and red pepper flakes. 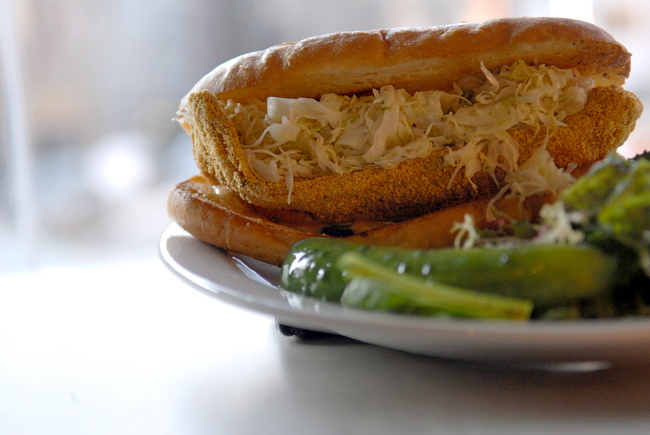 Homemade slaw and pickles adorn the sandwich, served on a soft sesame-seed encrusted bun from Caputo’s. Of course, the food has a Brooklyn twist. Sandwiches are filling but light. While sweet tea is required down South (they call it swaayyt-tay), Van Horn’s serves un-sweetened tea as well, a concept that is completely taboo in most parts of the Carolinas. 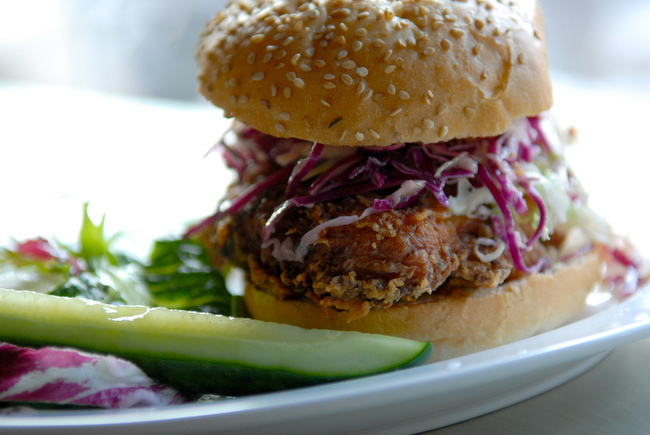 And while pulled pork is close to the heart of any North Carolinian, Van Horn’s various Southern-inspired offerings, and especially, its fried chicken sandwich, is garnering press, including write-ups in The New York Times and Wall Street Journal. What’s the secret to this juicy yet not greasy, delightful chicken? “Buttermilk,” Rick says. The chicken is salt-brined then dipped in a 20 percent-fat buttermilk laced with minced jalapenos, then dredged in flour and fried. “We spent a lot of time making sure there was something for everyone. With the pricing and the food options, people can come more than once a week, if not twice a day, which a bunch of people have done…” says Rick. I happened by the Van Horn Sandwich Shop just before it opened. Jacob and Rick are in the restaurant working. They invite me in. Jacob is obsessing over the floors, sanding them just perfectly, and says he’s redone them many times over. He tells me about his background as an architect, and how he decided to leave Williamsburg when he woke up to discover he was the oldest guy around. He thinks he might want to start a family in Cobble Hill, and would like to stay here a long time. He lives around the corner from the restaurant. 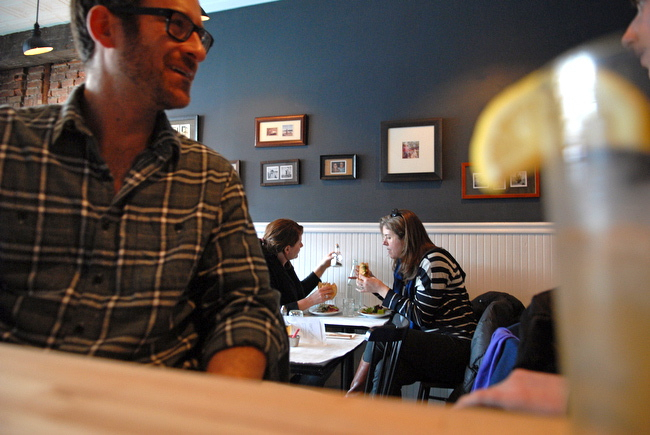 The idea is to create a casual, unpretentious place, with excellent food and friendly service. Jacob and Rick grew up across the street from each other in Chapel Hill. Jacob babysat Rick. But now, Rick’s in control, at least of the kitchen. 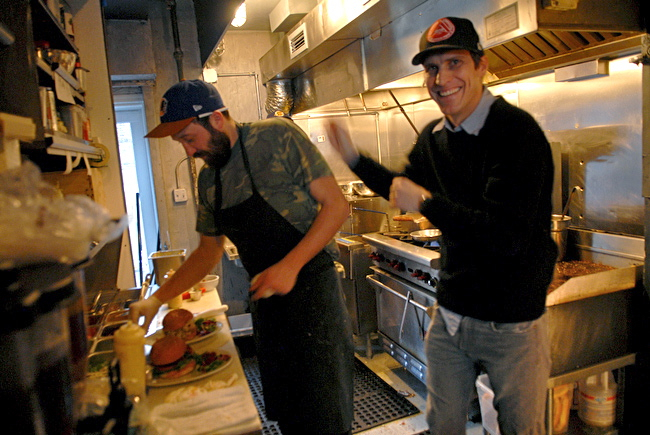 Since college, Rick’s worked in restaurants including Roberta’s in Bushwick, and the Commodore in Williamsburg. Rick was down in Tennessee, playing bluegrass, when his old pal contacted him to come be a chef on Court Street. Recipes were tried and tried again. Developing the menu was an arduous process, Rick says. Jacob says he wants to reinvent the fried chicken sandwich, in the sort of the way pizza and hamburgers were recreated as culinary religions. “You can get a $50 burger, but the fried chicken sandwich is sort of relegated to Chick-fil-A,” Jacob said, of the southern fast food joint. Jacob heard of a place in Oakland, Calif., that sells 800 chicken sandwiches a day, called Bake Sell Betty. He flew to check it out. “My hope is to create a place that can be taken over by the neighborhood. It’s bullet proof. Just use the heck out of it,” Jacob says. He even invites kids to spill food on the floor. “I hope people like it,” Jacob says. Fast-forward to today. The place jams on the weekends and is busy most days of the week. The two old friends work together day and night. They got so busy in the early weeks they’d run out of stuff. UPDATE: Van Horn’s back garden is open.